Yesterday, a creeper was invited to his friend’s party. Because of drinking too much alcohol, he lost his way to a mine. This mine is very dangerous and precious because the creeper can lose his life forever or he can be alive and gain treasure. In Dangerous Creeper, the creeper should destroy the mine, but he should not hit the blocks of the mine because his health will be decreased. He should move cleverly and collect supportive items to improve his health and gain other benefits. Specifically, his health will be improved if he gets a red cross. A red bomb increases the range of explosion of bombs while a big yellow bomb explodes blocks randomly. 2X doubles players’ scores. A blue square slows down his speed. A clock increases the length of time. There are two bars indicating time and health. Increasing time and health is very important in Dangerous Creeper, so try to move skillfully by less hitting the blocks and getting supportive items. 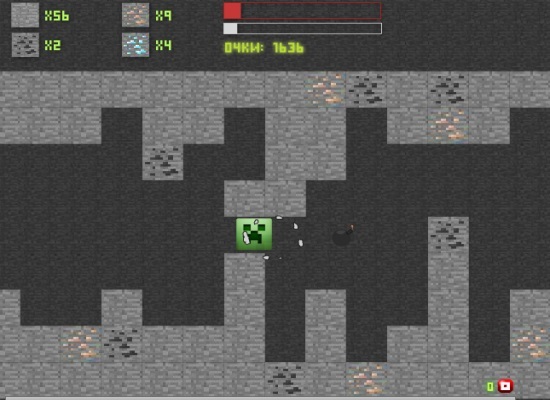 Share with the game community about how clever you are in Dangerous Creeper game! They are waiting for people who can beat their scores beautifully. Dangerous Creeper is played with the mouse.